Representative Honours: Northern Ireland: 12 Full Caps / 7 Goals (1961-1967), 1 ‘B’ Cap (1960), Youth; Irish League: 11 Caps / 1 Goal (1958-1969). Club Honours: (with Glenavon) Irish League Champion 1956/57, 1959/60; Irish Cup Winner 1956/57, 1958/59, 1960/61; City Cup Winner; Gold Cup Winner; Ulster Cup Winner; North-South Cup Winner 1962/63; (with Dundee) Scottish League Cup Runner-Up 1967/68; (with Coleraine) Ulster Cup Winner, Top-Four Cup Winner 1968/69. 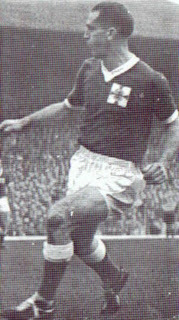 Sammy Wilson won Northern Ireland Youth caps and a B cap against France in 1960 before graduating to the full side in 1961. At the time he was playing for Glenavon, under the stewardship of former international Jimmy McAlinden, as a fast moving goal-scoring outside-right. It was McAlinden who switched Wilson to centre-forward, as replacement for the legendary Jimmy Jones, and the success was immediate as he scored a hat-trick for Glenavon against Shamrock Rovers in the North-South Cup. It was the press reports from this game at the Milltown Stadium that prompted former Ballymena United manager Alex McCrae to take Wilson to Scottish football with Falkirk in 1963. The move proved to be a spring-board for Wilson’s international career. He won his second cap just a few months after moving to Falkirk, scoring in a 2-1 win over Scotland at Windsor Park. A month later he scored twice at Wembley as England ran out 8-3 winners. Jimmy Greaves scored four for England, but Wilson gave a good account of himself in his rousing tussles with England’s centre-half Jack Charlton. In 1967 Wilson played in the Scottish League Cup Final for Dundee, a game that ended in a 5-3 defeat by Celtic and the following year helped the Dees qualify for the semi-finals of the Fairs Cup, where they narrowly lost out to Leeds. 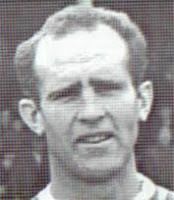 He returned to the Irish League with Bertie Peacock’s Coleraine in 1968. In a long and successful career Wilson also represented the Irish League on a number of occasions and picked up Irish League, Irish Cup, City Cup, Ulster Cup and Gold Cup Winners’ medals with Glenavon and added Top Four Cup and further Ulster Cup Winners' medals with Coleraine. In the 1959 Irish Cup Final he scored Glenavon’s first in a 2-0 replay win over Ballymena United. On retiring from playing in the early 1970s Wilson settled in his native Dromore where he became a farmer, auctioneer and estate agent. He is still fondly remembered at Falkirk, where his picture adorns the wall of the club's International Lounge. Summary: 12/7. Won 5, Drew 0, Lost 7. Sammy coached at Dromore Amatures in the early eighties and I gained more in one training session with him than a lifetime in football, a true gentleman loved by all who were lucky to know him. Sammy's goals per game record in international matches was better than that of Billy Gillespie, Colin Clarke or David Healy. Good point Bas - more kudos to Sammy! 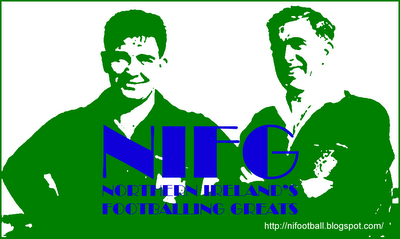 Did you get my comment about Sammy's tussles with Jack Charlton? It was surely Monty Norman.